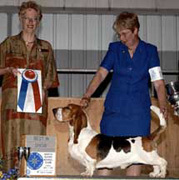 Sue grew up in a family involved with breeding and showing Basset Hounds and Dobermans. The also showed hunters and jumpers. 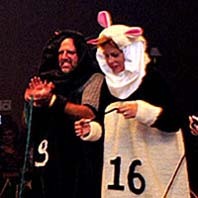 The family Basset Hounds were considered by Sue to be her pets. She showed horses throughout her childhood, including an American Hose Show Association Horse of the Year, Riot Free. She spent fifteen years as a professional horse trainer, spending many weeks a year on the road with her students and their horses and ponies. Sue spent only one day in her life without a Basset Hound, and it was a very long day. 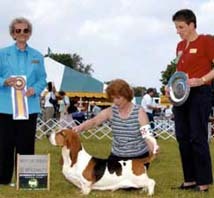 She began showing Bassets about thirty years ago and has continued as a breeder and handler ever since. 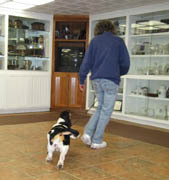 Sue began working with Topsfield in 1996, after meeting Dom & Claudia when they purchased a dog from breeders in Florida. As the permanent full-time Resident Handler and Kennel Manager, she feels lucky to work great people and wonderful dogs and is extremely happy to be doing something she loves. 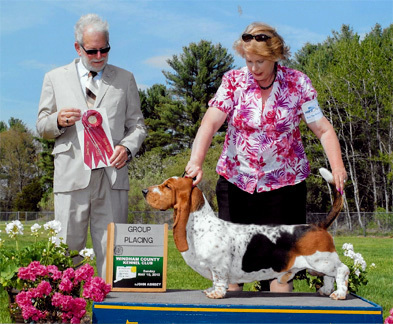 In addition to showing the majority of the Topsfield hounds, Sue oversees the breeding, conditioning, whelping, and training of all Topsfield litters. She travels regularly with the hounds for shows and enjoys meeting our puppy people as well. 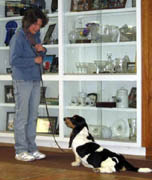 She brings with her years of experience as a breeder and handler, as well as an avid interest in computers and photography. 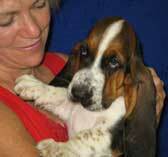 She enjoys working and spending time with our fellow Basset Hound breeder friends. She also has a big interest in helping provide educational opportunities for people involved in our breed. 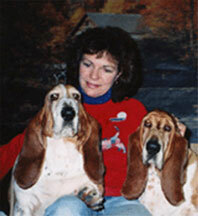 Sue was responsible for bringing the BHCA's education program, Basset Hound University online. 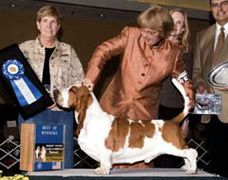 BHU was developed for the BHCA by Claudia Orlandi, originally in print format, and was moved online to make it available worldwide at no charge for basset hound . 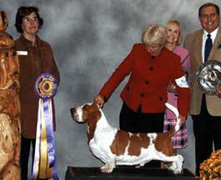 It is available for owners, breeders and judges through the BHCA Website at www.basset-bhca.org . & Click on the education button to see BHU. 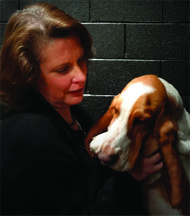 One of the most rewarding parts of Sue's job is the teamwork and relationships established with the Basset Hounds. All have different personalities and habits, and present interesting challenges. For example, Arty, trained and shown by Sue went Winners Dog & Best of Winners at the 2007 BHCA National Specialty & Best of Breed at the 2009 National Specialty. 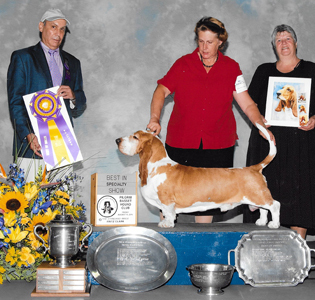 Sue & Arty teamed back together at the Nationals in 2013, with Arty winning his Veteran Dog Class, the Veteran tribute, in addition to the honor of being the Peoples' Choice. 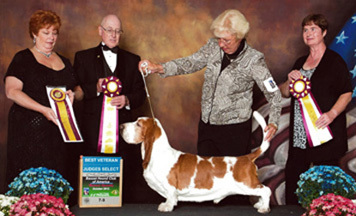 CH Topsfield-Sanchu Pop Art O' Bridi, ROM, Best of Winners in 2007 left, and Best of Breed at the 2009 Basset Hound Club of America National Specialty, right, and in the middle, winning the Judges' and Peoples' Choice Veteran Tribute at the 2013 BHCA Nationals. Now Sue is enjoying bringing along Arty's son, GCH Topsfield-Sanchu Poppycock also known as "Pepe." At just two years of age, Pepe is already a multiple Best In Specialty Show Winner, won the breed at Westminster in 2016, and received an Award of Merit at the 2016 BHCA Nationals. It is quite rewarding to bring along fine young Basset Hounds that you whelped, cared for and trained, and have the great privilege of watching them grow into themselves. Each year brings new puppies, younger ones mature, and others retire. For Sue, this brings constant change and challenge. Show days are busy, challenging, and always interesting. It is great that we get to see our friends that are involved both in our breed and others. There is always something new to learn. At home, every day is different at Topsfield, some days are filled by working with puppies, some days are spent with grooming chores and some days are just about having fun with the dogs. The Topsfield Website was designed and created by Sue Frischmann. Linda has been with Topsfield for over twenty years. Her expert, loving care of the hounds is indispensable. 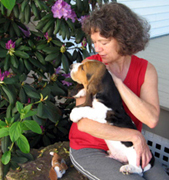 In addition to daily care of the hounds, Linda starts training our puppies at two weeks of age. She cares for the kennel and the Bassets when we are at the shows. She also trains some of our hounds for Obedience. 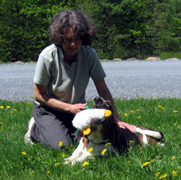 Linda ran an obedience center in Connecticut before she, husband Tony and their two children moved to Vermont. Linda and her family which includes a very smart Australian Shepherd, Colby and two cats live next door to Topsfield Kennel. Linda occasionally meets with new owners of puppies. Her contribution to Topsfield and the hounds is invaluable. 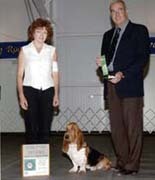 Candy has been a professional all breed handler for over thirty years. She resides in Connecticut is a great asset to Topsfield. 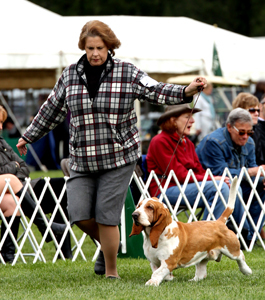 At any given time a couple of the Topsfield Bassets live with Candy and travel to the shows. Candy also covers for Sue is unable to travel. Candy's great assistance and her expertise is invaluable to Topsfield. Candy attends the Nationals with us each year. She & Sue travel together to many of the shows. 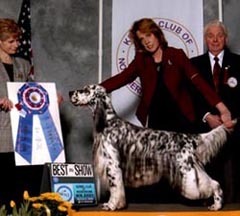 Candy was brought up in the "old school and has worked with many of the elite handlers of their day, including Annie Rogers Clark and Bob and Jane Forsyth. 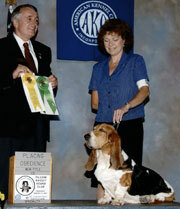 Laddie Carswell, Candy's father, was a successful professional handler and breeder. Candy grew up in the dog fancy and has been very generous with both her knowledge and her time. 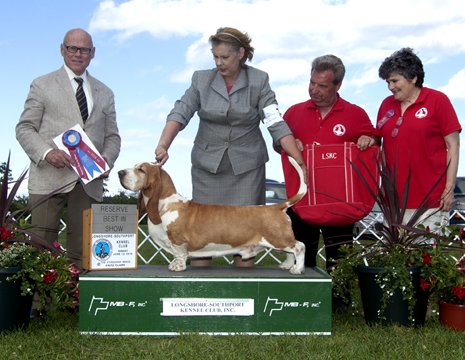 While Basset Hounds were a new breed for Candy to show when she began working with us, her vast experience with so many breeds served her well. Candy adapted quickly to the breed, and became quite a fan. She does a wonderful job. She has taken the time to study and understand the structure and temperament unique breed and does a great job presenting them. 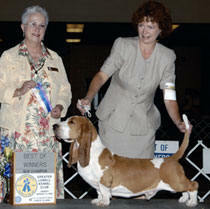 She is a member of the Basset Hound Club of America. Candy's sense of humor, unmatched patience and a giving spirit have added much to our Topsfield Team. Thanks, Candy! We are blessed to have the services of Mark Basol, DVM and his entire staff at the Vergennes Animal Hospital. We at Topsfield are privileged to have the assistance and advice of such very talented individuals. Principal owner, Dr. Basol has passed the 20 year mark at Vergennes Animal Hospital. Certified in acupuncture and herbology, he practices traditional medicine with an eastern influence, when warranted. A strong believer in preventative medicine, Dr. Basol spends a fair amount of time performing surgery. A Midwestern transplant, he completed his undergraduate studies at North Dakota State University and received his DVM degree at the country's oldest veterinary school, Iowa State University. Mark now takes the lead in the care of the Topsfield hounds. In addition to having experienced, caring vets, one of the most important factors for us is having a skilled team supporting them, and us, when we call in. We can always count on the staff to make sure we get the best care possible for our Bassets. We often recommend Vergennes Animal Hospital to our breeder friends and our pet owners. We know they will receive quality care for their dogs and the advice that they need to make informed decisions. Topsfield owes much of its success to the guidance and expertise of Donald Peddie, DVM (pictured left), who provided veterinary care for Topsfield hounds for more than a decade. In practice for over thirty years, Don is a graduate of Cornell Veterinary School and specialized in small animal medicine with a specialization in orthopedics. 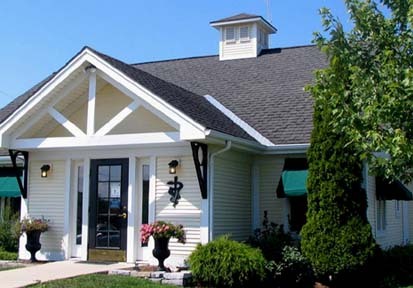 Don retired from private practice and closed his clinic, Cider Mill Animal Hospital which was located 25 minutes south of Topsfield in Cornwall, Vermont. Don's contribution to Topsfield's success is much appreciated. 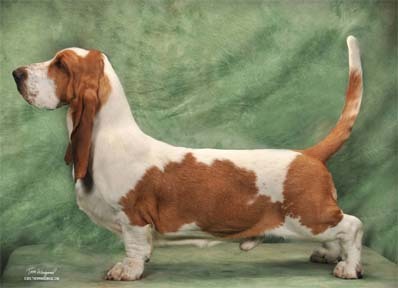 Don describes his experience with the uniquely structured Basset Hound as a wonderful challenge. We were truly fortunate to have had Don's services for so many years. He eased in retirement at Vergennes Animal Hospital, where we have made new friends, and established a good working relationship and confidence in their care. We do have a few cats that are members of the Topsfield Family. Cooper, Cecil and Raisin were littermates with distinct personalities. Sadly, Cecil is now gone, but Raisin and Cooper do their best to make sure to keep the dogs and us entertained. Cooper is simply nuts and likes to sneak into all vehicles to see if he can hitch a ride. 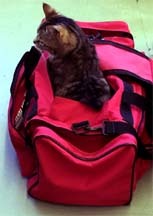 He likes to stowaway in bags when we pack to travel. Raisin is an active girl who prefers to spend her time prowling the property.